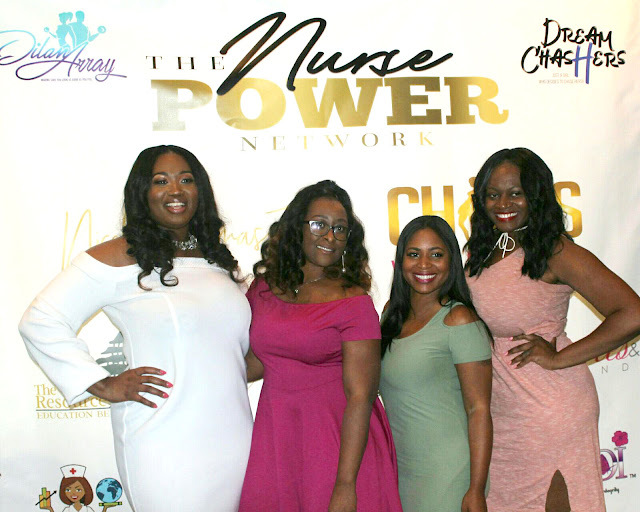 On Saturday, July 1, 2017 Chicks with Cheques & Nicole Thomas INC. held it's first Nurse Power Brunch at the Essence Music Festival in New Orleans, LA. More than 50 guest gathered for a panel style brunch provided by Morton's Steakhouse. The brunch kicked off with a red carpet experience hosted by personal stylist, Kia Nicole. Guest enjoyed photo opportunities, mini interviews provided by media partners, and photo props sponsored by Lawrenn Propz. The panelist included nurse entrepreneurs: Meisha Amia, Nicole Thomas, Priscilla Williams, and Takara Butler. They led the panel discussion about their journey as a healthcare professional to entrepreneurship. Specifically the nurse entrepreneurs talked to the guest about tapping into their power to be fulfilled, starting a business, brand awareness, and handling fear. The brunch ended with international networking, a selfie with a stranger challenge, and amazing giveaways from kind sponsors. Black Pearl Entertainment served as media partners, conducting interviews and photographing the gathering.